The terms and abbreviations listed here are confusing, arcane, ambiguous and otherwise useless. We get really annoyed when folks write "N/K" on an MSDS instead of simply stating "Not Known". 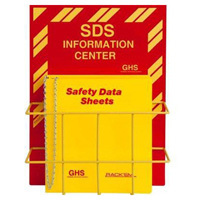 There is no good reason to abbreviate terms on an MSDS Material Safety Data Sheet! C - Ceiling Value. For example, Toluene-2, 4-diisocyanate (TDI) has a PEL of (C)0.02 ppm. Code - On some MSDS's that come out of the Department of Defense (DoD) HMIRS database, we have seen codes associated with almost every field that have are typically "M" or "T". These do not appear to be HMIRS Health Characteristic Codes. We hear directly (third-hand) that in this post-9/11 world the DoD does not wish us to know what the codes represent, even though they have released the codes for each entry! If anyone knows more about these, let us know. EST - Eastern Standard Time Estimated (could also be "Established" when written "Not Est"). MST - Mountain Standard Time Mist. N/A (sometimes "NA") - Not Applicable, Not Available. N/Ap (sometimes "NA") - Not Applicable. N/Av (sometimes "NA") - Not Available. ND - North Dakota None Determined or Not Determined. NE - Nebraska North-East None Established. NEGL - Negligee Negligent Negligible. N/K (sometimes "NK") - Not Known. N/P (sometimes "NP") - Not Provided. REC - (sometimes "R") Recommended. Do not confuse with RTECS. SUP DAT - "whaSup (with) 'Dat?" Possibly "Supply Missing Data" or "Supplementary Data". Apparently a database artifact? WATER -Z26020 (or other Z-type numbers), found under the solubility description. This is an error on certain outdated Sigma-Aldrich MSDS's; looks like their computer forgot to put in the correct value. Wilson RISK Scale - as described in a separate entry, this is a proprietary hazard rating system for which we can find no detailed information. Without such information, this (or any other) rating system is essentially useless. Your opinion may differ, of course. If you find others, let us know. Acronym Finder claims to know 750,000+ acronyms. See also: The Index Page of this site.